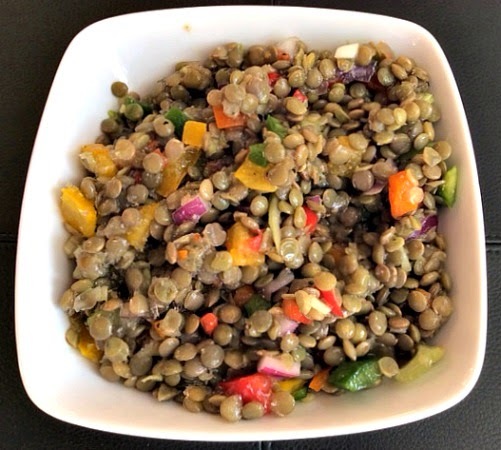 This recipe for Lentil Salad with Tri-Colored Peppers is a vegetarian friendly dish that is also packed with fiber, folate, and healthy fat making it a great super food side or a perfectly filling meal on its own. Lentils, a small but nutritionally mighty member of the legume family, are a very good source of cholesterol lowering fiber. Not only do lentils help lower cholesterol, they are of special benefit in managing blood sugar disorders since their high fiber content prevents blood sugar levels from rising rapidly after a meal. But this is far from all lentils have to offer. Lentils also provide good to excellent amounts of seven important minerals, our B vitamins, and protein with virtually no fat. This tiny nutritional giant fills you up not out. Wash the lentils thoroughly and drain. In a large pot, bring 2 quarts of water to a boil. Add the lentils, garlic, and salt. Simmer for 30 minutes, or until the lentils are tender. Drain, discarding the garlic. Set aside. Just before serving, toss the lentils with the peppers, red onion and vinaigrette; check for seasonings. Serve at room temperature. For the vinaigrette, in a small bowl, whisk together the vinegar, mustard, and seasonings. Gradually whisk in the oil until the mixture thickens and emulsifies. I will just love your Tri Colored Peppers in this fabulous Lentil Salad. Thanks so much for sharing this awesome recipe with Full Plate Thursday. Hope you are having a great weekend and come back to see us real soon!